Susanna Lin and Tawny Bates, members of the Wallingford Community Council, look up at a massive willow in the Wallingford neighbor hood. Tawny Bates knows the trees in her neighborhood well. She points them out as she walks down the street on a recent afternoon — the big leaf maple, a chestnut, a willow, a blue spruce. These towering trees, she says, are in the crosshairs of development — eight of them, each roughly 40 feet tall, in a three-block radius in her little corner of Wallingford alone. “You know, we used to have majestic old forests here,” she says, resting one hand reverently on a massive willow while holding a big binder containing highlighted sections of the Seattle Land Use Code in the other. She speaks in a calm but impassioned voice as she describes the benefits that mature trees provide: they fight air and water pollution, cool the neighborhood and buffer residents from the urban din. Bates and her fellow members of the Wallingford Community Council fear that those benefits could soon be lost as the city adopts new development plans that they feel threaten to diminish Seattle’s tree canopy. “Do you think these are going to survive? No. They’re going to clear cut Seattle again,” Bates says as she gestures toward a blue spruce at the edge of her property. Seattle’s urban canopy is sparking debate now because the city is considering adopting growth policies that would allow for more development. Bates and other tree advocates argue that the policies don’t sufficiently protect trees. They point to a history of inaction by the city in protecting the Emerald City’s green umbrella. Existing tree protections on private property are ineffective, critics say. Although the city said it would strengthen those rules, which affect more than half of Seattle’s tree canopy, little has been done. Meanwhile, city officials are unable to answer this simple question: Is the canopy growing or shrinking? At issue is the 58 percent of the city’s urban forest that is located in single-family residential zones. These zones have become a major point of contention as the city explores options to increase density through both an update to the city’s Comprehensive Plan and the adoption of Mayor Ed Murray’s Housing Affordability and Livability Agenda. Single-family homeowners and neighborhood preservationists are concerned that the policies will pack too many people into their neighborhoods, diminish parking options, encourage gentrification, and result in a decline in general livability. That livability issue is where the tree canopy comes into play. HALA proposes allowing the city to upzone single-family homes within a ten-minute walk of designated “urban village centers,” such as central Fremont, and transit hubs like the planned Roosevelt light rail station. If the council decides to adopt HALA’s proposals, developers will be allowed to build higher and wider––sometimes all the way out to the edge of the lot, leaving little to no room for trees. And for all its detail on development, the 76-page HALA proposal does not once make mention of trees. This go-round, the percentage goals remain but the “no net loss of canopy” goal has been removed. City planners say it was redundant and removing it signifies no change in policy, but neighborhood groups fear that without the “no net loss” language, it will be easier for the city to go back on its word in the future. “This plan seems like it is development at all costs,” says Susanna Lin, a board member of the Wallingford Community Council who, along with Bates, was one of several activists who showed up at a recent public hearing before City Council members. The City Council in 2009 launched an effort to get a handle on the loss of canopy on private land, ordering the Department of Planning and Development to draft a new tree policy. But when the draft ordinance emerged in 2010, the city’s one-year-old Urban Forestry Commission cut the proposal down to size, saying it was not nearly protective enough. The process was bogged down by disagreements between tree advocates and developers, budget cuts, and a lack of support from Murray and his predecessor, Mike McGinn. The City Council member championing the effort, Richard Conlin, was not reelected. Inertia ensued, leaving only a bare-bones interim tree ordinance in place for the last seven years. It established that “exceptional trees” that are “of significant size or have historical, aesthetic or ecological value” are protected. But there’s no systematic approach to enforcement and little is happening. 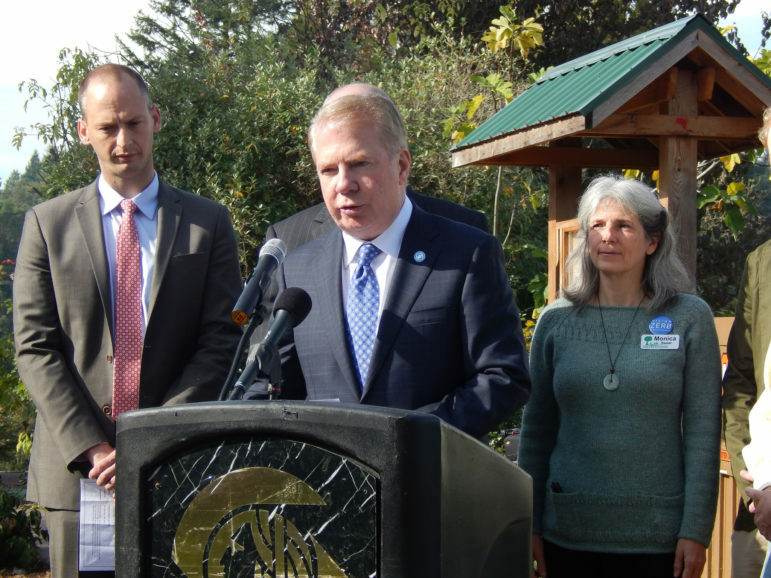 Mayor Ed Murray speaks at an event to unveil a proposal to build more sidewalks. How did Seattle fail to deal with this issue back during the recession, when development pressures were less? Critics note that when the city handed the chore of defending Seattle’s trees to the development-oriented DPD, it was putting the fate of the canopy in the hands of the city department perhaps least likely to take the job seriously. Despite marching orders from the council, the agency never updated the 2009 interim ordinance. “DPD just never did it. They just kept dragging their feet. I don’t think they ever took it seriously and never finished it,” said Matt Mega, who served on the Urban Forestry Commission from 2009 to 2012 as a representative of the Seattle Audubon Society. The recommendations that emerged from the Urban Forestry Commission were outweighed by concessions to developers when draft legislation appeared, Mega recalls. Years later, he is seeing the results of that failure. Creating strong, livable cities is a balancing act, says Bryce Yadon of the smart-growth advocacy group Futurewise. Density prevents urban sprawl, which has a lot of environmentally healthy effects including reduced greenhouse gas emissions and less water and air pollution. But density done right involves leaving some greenery intact within urban areas. The research is in. Urban trees are worth saving. The benefits of trees in cities are numerous. Cleaner air and water, reduced heating and cooling costs, and improved stormwater management are just a few of the better known ones. But the full societal benefits of a healthy tree canopy extend beyond the environment and are just starting to be understood. New research is finding that trees improve the health of humans around them to a greater degree than previously understood. Urban environments with more trees have populations with less stress and better immune responses. Symptoms of some mental health conditions, such as attention deficit hyperactivity disorder in children and clinical depression, wane in the presence of trees, according to Kathleen Wolf, a research social scientist at the University of Washington School of Environmental and Forest Sciences. Then there are the hard numbers. According to the 2012 “Seattle Forest Ecosystem Values Report,” which was commissioned by the city, the replacement value of Seattle’s urban forest is estimated at $4.9 billion. That value, estimated through methods established by the Council of Tree and Landscape Appraisers, takes into account the hard costs of replacing the urban forest, as well as environmental factors. The report states that trees save the city government more than $11 million annually in carbon storage and sequestration and remove $5.6 million worth of pollution from the environment every year. The urban forest also reduces energy use in residential buildings, creating an annual savings of $5.9 million dollars. Maintaining this valuable resource is tricky. Seattle’s urban forest has a unique combination of challenges, including narrow planting strips, rapid development, and a high value placed on unobstructed views, says City Arborist Nolan Rundquist, who manages trees on public land for the Seattle Department of Transportation. Root space is also crucial to building a large canopy, Rundquist stresses. But as yards get smaller, that space goes away. “It takes a lot of space for a tree to thrive, especially a large tree,” says Andrea Mojzak, the tree canopy expert at local sustainability nonprofit Forterra. Much of that space is underground, where root zones expand far wider than the trees themselves. These large, urban trees are what Mojzack calls “superpowers in terms of ecosystem benefits,” providing far more bang for the buck than their smaller siblings. Rundquist estimates that when a large, mature tree, such as a big leaf maple, comes down, it can take 30 or 40 years for two replacement trees to provide similar ecosystem benefits. That’s a big hit for the canopy with longlasting effects. This difference of impact between large trees and small ones is one reason that measuring overall tree canopy is challenging. Seattle’s current statistics are uncertain at best. Canopy assessments over the last fifteen years have ranged from 23 percent city coverage to just below 30 percent. But because the studies were carried out with differing methodologies and varying levels of uncertainty, it’s not possible to accurately compare statistics over time. The city’s urban forestry experts at the Office of Sustainability and Environment are eager for the results of a new canopy cover assessment. This assessment, due early next year, uses improved technology and will allow for the city’s first statistically significant comparison with previous figures. But even that won’t be enough, says arborist and tree activist Michael Oxman. He argues that a city-wide tree inventory is needed, one that would take tree size into account. “It’s a prerequisite to intelligent decision making,” Oxman says. A citywide inventory would be a huge and expensive undertaking. Though the idea has been proposed, the city balked at the cost. An inventory of the city’s street trees is underway, but that’s just for trees on public land. When it is finished in a couple of years, the majority of the canopy still won’t be included. “This is the town that Microsoft built, and if we can’t get a database of … trees, then we’re in pretty bad shape,” says Oxman. As Steve Zemke pulled up to his house one afternoon a few years ago, he saw a man with a chainsaw about to cut down a 50-foot-tall spruce tree at the corner of his yard. He was alarmed. It turned out his neighbors, tired of the tree dropping needles on their roof, called out a contractor with a chainsaw. Zemke, chairperson of Friends of Seattle’s Urban Forest and vice chair of the city’s Urban Forestry Commission, says this kind of thing is happening all the time but hardly anyone is noticing. The solution he and the Forestry Commission advocate: Do what many other large cities already are doing. Require a permit each time anyone cuts down trees above a certain size. Had that happened when the neighbor eyed the tree that turned out to be on Zemke’s land, Zemke would have spotted a notice on the tree — just as happens for two weeks before trees on Seattle’s public lands can be felled. The Forestry Commission argues that instituting a permit system would greatly decrease the number of trees people remove. Current city policy allows for up to three trees to be removed per lot per year, with no specification on size. And lots under 5,000 square feet are exempt from this rule, meaning many homeowners can remove whatever they like, whenever they like. The Forestry Commission recommended a permit system for removing trees in 2010 and Council Member Conlin backed it. But the Department of Planning and Development (split last year into two agencies) wasn’t willing, saying it would be too expensive. That, Zemke says, is the problem. Strong permit systems are where other cities have found success in regulating private property trees. So why couldn’t Seattle make that happen? Zemke is ready to point the finger at the Department of Planning and Development. Two years ago the Urban Forestry Commission asked Council Member Sally Bagshaw to take up the issue in Conlin’s stead. 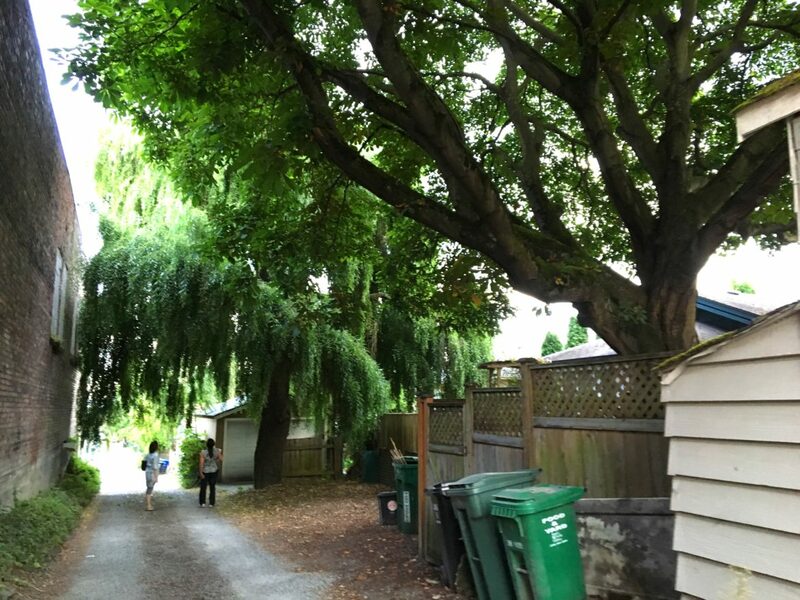 Bagshaw has become the new champion of urban forestry on City Council, says Sandra Pinto de Bader, urban forestry advisor at the Office of Sustainability and Environment. She has led the effort for a research project assessing the effectiveness of current private property tree regulations. No efforts on a new ordinance have been started, though. The Urban Forestry Commission will continue urging City Council to dust off the unfinished tree regulations and get back to work, according to the commission’s 2016 work plan. Commission members are hopeful that the new data provided by the upcoming canopy cover assessment and the study of current policy will spur a new tree ordinance. But by then Seattle’s 20-year growth blueprint will be law. Will Seattle’s tree canopy be merely an afterthought? Great article! Trees v. Density is a false dichotomy. If you ‘build up, not out’ inside the City then you can have both. If we lose our trees and green spaces, the remaining hostle environment will cause people, especially young families, to leave the City for the burbs. And that defeats the purpose of Smart Growth. It’s already happening. Smart growth doesn’t work. High density causes traffic congestion, air pollution, and crime. I’m not aware of any city with smart growth that is a pleasant place to live. Look at Boulder, Colorado. Wide, congested, 6 lane boulevards around towers everywhere. The same thing is happening in Tempe, Phoenix, and Scottsdale. The best thing is to eliminate the regional urban growth boundary, and build at the urban fringe out near North Bend or Hobart, on nice, one acre lots with tree ordinances and mountain views. Jamming everyone into the existing urban growth boundary has created horrible traffic conditions, high crime, and very long commutes. Many people have left Seattle due to the state growth management act requirement for high density. Dear Editors, please approve, I have said nothing wrong and have not violated any terms of service. This is my third time trying to post. If you keep deleting my comments, I will call you. Smart growth, doesn’t work, since all the occupants of the towers still drive cars. I have never seen a city where smart growth works. Here in Scottsdale and Phoenix, we have horrible traffic congestion and air pollution, due to cars from tens of thousands of Smart Growth Towers. What would work would be to stop smart growth infill within the metropolitan Seattle area, get rid of King County’s urban growth boundary, and build new family friendly neighborhoods out near Hobart or North Bend. Or, how about a hippie commune out there of organic farmers? We’re a small organization. We just saw these comments incoming. Thanks so much for your interest! Cass, Thanks for all your good work on behalf of urban trees and we humans who need them more than we realize! keep it up! If we are serious about battling global warming, we will not only stop cutting down trees, we will plant them. The trees are one of our great vanguards against what is happening as well as providing clean air for us to breathe. Cutting down our rainforests in the NW as well as in Brazil have contributed mightily to today’s problems. Why don’t people know this! This is a great article and should be required reading for all of those people who have a part in deciding the future of Seattle and King County. This is real SCIENCE, not a belief system, and the loss of trees changes the future for our children and grandchildren. Trees are an endangered species in Seattle. Visionary thinking is lacking from policy makers and us the residents, who want unencumbered views. Mature trees are clear cut to build luxury homes or boxy towers built lot line to lot line. An umbrella on a rooftop open space does not provide the services that a sizable tree does. And those rooftop decks are useable maybe 5 or 6 days a year. Small trees are planted on planting strips but many do not survive due to lack of watering by the homeowner who just spent $1 million for the house. This is not sustainable. Save and plant more trees or all of us will pay a price.